In this article, we'll develop an automated solution that checks rental car prices on the Costco Travel site. It will send us an SMS message with the lowest price in each category on a daily basis. Lambda is Amazon's serverless compute platform which allows us to run our code without the need to rely on servers. It supports code written in Node.js, Java, C#, and Python. SNS is Amazon's notification service and allows us to send SMS messages from Lambda. SMS messaging is not available in all regions. For more details, check Supported Regions and Countries from the Amazon SNS Developer Guide. In this section, we'll walk through the steps to configure SNS. Topics are basically lists of subscriptions that we can publish messages to. In the SNS dashboard, click on Create topic. Let's create a topic named NotifyMe. Each topic is assigned a unique identifier called a Topic ARN. Make note of this since we'll need it later in our code. Select SMS from the Protocol dropdown list. If SMS is not listed, then the region does not support it. A confirmation text message will be sent to the number. Suppose we're planning a trip to California, and we're flying into LAX. We can see below that the lowest price is $171. When the page containing the search form loads, the web server sends a cookie in its response header named Csrf-token. This token will be used by the browser during form submission. This URL requires that form submissions include the CSRF token. We'll be using the second page for our solution. NPM is the package manager that comes bundled with the Node runtime. The latest version of Node can be downloaded from here. Here's the code that does all the heavy lifting for us. First, we invoke the require method to tell Node we want to use the packages for request, cheerio, and the AWS SDK. Next, we configure the AWS client object for us-east-1. We declare a formData object to be used in the POST request. This object references some environment variables we'll define in a later section. Next, we define the URL we want to submit the form to and an options object to be used by the request. The User-Agent can be any arbitrary string and this is usually set by our browser. Since there is no browser here, we'll be good web citizens and set it to our site name so the web site owners can see that in their logs. The next section in the code declares a handler function that is required by Lambda. Inside the handler function, we call the request.post() method and pass in our options object and a callback function. The request callback function defines what happens on error and success. On error, we simply want to output "Form submission failed" to the Lambda callback. On success, we want to parse the response body which contains our prices. However, these prices are buried inside a ton of HTML markup. This is where cheerio comes in. We load the response body into cheerio. Then we use standard CSS selector syntax to grab the prices and populate a map with the keys as the car categories and values as the lowest price in that category. The prices have dollar signs and commas which we filter out using parseFloat() function. We then find the lowest value in the array using the Math.min.apply() function. Finally, we can create an SNS client, define its parameters, and publish the message to our topic. This results in SMS message delivery to all subscribers of that topic. Before we can run our code on Lambda, we'll need to create a deployment package. The deployment package is a ZIP file that includes our index.js file, package.json, and the node_modules directory that holds our dependencies. We need to be careful to package the contents of the directory, and not the directory itself. The node_modules directory will have a bunch of stuff in it because request and cheerio each have their own dependencies. For more details, check out Creating Deployment Package (Node.js) in the Amazon Lambda Developer Guide. Now we're ready to create our Lambda function. 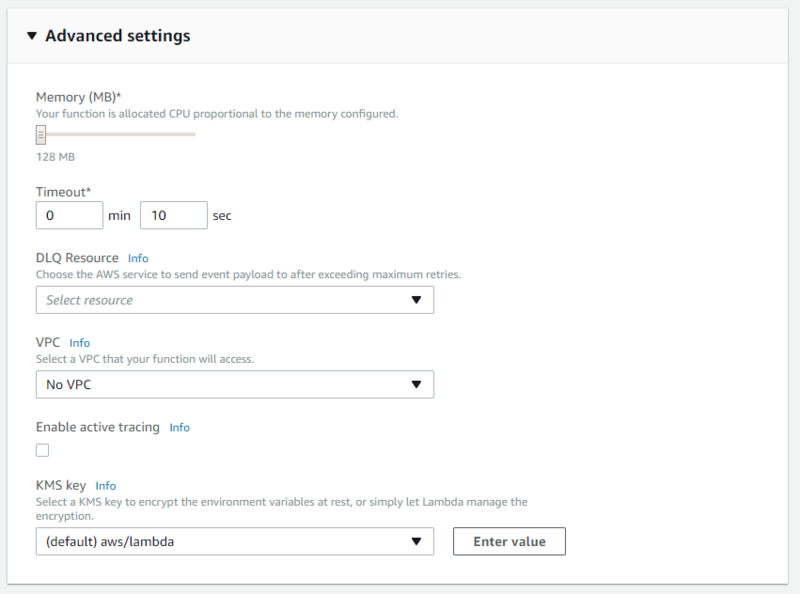 In the Lambda Management Console, click Create a Lambda function. On the Select blueprint page, click Author from scratch. On the Configure triggers page, select CloudWatch Events from the dropdown. We'll create a new CloudWatch rule so the Lambda function can run on a schedule. Next, we're taken to the Configure function page. Here we'll enter a name for the function and select Node.js 6.10 as the Runtime. In the Lambda function code box, we'll select the option to Upload a ZIP file and then click the Upload button. Then we select our deployment package file. Lambda supports environment variables so we'll use these to define our search criteria rather than hard coding them into our function. We'll also define a variable for our SNS topic ARN so we can change it easily later. In the Lambda function handler and role box, we'll leave the handler name as index.handler and choose an IAM role that has permissions to publish to our SNS topic. In the Advanced settings box, let's increase the timeout to 10 seconds. On the Review page, click Create function. Our Lambda function has now been created with the schedule trigger in a disabled state. Click Save and Test on the next screen asking for inputs to run the function.